Due to the rapid urbanization, the ever-increasing concrete jungles, the destruction of innumerable trees and forests as also their decreasing numbers as a result of forest fires, the enormous adversity of global warming is left glaring straight at us. The environmental destruction, increased degradation as also its imbalance, are incessantly ringing the warning bells to raise alarm over the threat posed to the very existence of the common man. It is a grave necessity to have at least 33% of land area under high-density forest cover. In India, however, such a situation has not arisen. Moreover, it is being neglected due to various reasons, and no concrete solutions and plans have yet been worked out to tackle the problem. Taking these factors into consideration and being mindful of our responsibility towards the society, the collaborative effort of Shree Aniruddha Upasana Foundation in association with its sister organisation, the Aniruddha’s Academy of Disaster Management had undertaken the initiative of Tree Plantation. The project envisages of planting different types of trees and carefully nurturing them. On 30 November 2017, Sadguru Shree Aniruddha had presented the gift of four of his initiatives to his Shraddhavan friends while addressing them at the ‘New English High School’ ground. At the time, he had imparted information about Shree Vanadurga Yojna which emphasizes on the importance of tree plantation. The seeds of the fruits, which we consume at home viz. the custard apple and the sapota or chikoo are bigger in size and do not decay soon either. In that case, it would be ideal to create a little seed-ball by implanting the seeds in soil mixed with the fertilizer, instead of just disposing of them. The seed-balls can be planted while going to a picnic or travelling over the weekend. It may be planted at a vacant space, alongside the road if it has some amount of soil and then should be watered. If everyone planted merely ten seed-balls in such a manner and at least two of these grew into trees, the tree plantation effort would definitely be considered a success. Sadguru Shree Aniruddha thus explained the working of the programme. After its announcement, the ‘Shree Vanadurga Yojna’ was implemented by seed-ball distribution through various campaigns of the organisation. Nevertheless, it is not the first time Sadguru Shree Aniruddha undertook a tree plantation or forestation initiative but had implanted the concept back in the year 2004. On 6th May 2010 during the discourse on ‘Ramrajya’, Sadguru Shree Aniruddha had said, ‘by planting specific trees and plants on a large scale, the issues such as deforestation, soil erosion, encroachment of deserts can, with certainty and efficiently, be overcome’. He also imparted in-depth information on how and where the tree plantation activity can be carried out. Subsequently, interested Shraddhavan volunteers were trained for it by ‘Shree Aniruddha Upasana Foundation’ at the ‘Aniruddha’s Institute of Gram Vikas (AIGV)’ at Govidyapeetham in Kothimbe, Karjat, and the programme continues still. Collective tree plantation drives are arranged by various Upasana Centres of Shree Aniruddha Upasana Foundation. Shraddhavans receive support from the local authorities in organizing for open spaces, on the two sides of a highway, on a mountain or hilly region or any other apt place for plantation, and even by supplying seeds and saplings of high quality for the required plantation. Moreover, Shraddhavans at times even look for available spaces and then organised for a collective plantation drive by funding it themselves. 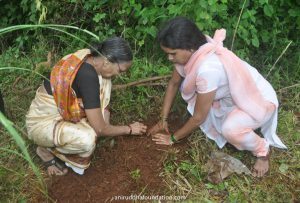 Moreover, Sadguru Shree Aniruddha has guided his Shraddhavan friends on undertaking the forestation activity on an individual basis. Shraddhavans, have hence been contributing to the tree plantation initiative by planting at least the Tulsi (Holy Basil) and five other plants (viz. the curry leaf plant, Rose, Jasmine, Ginger and Zipri) along with it in the window or balcony terrace as per personal capacity. Furthermore, the drive is being propagated to the society and encouraged by gifting saplings of either the Tulsi or other flowering plants to each other on social occasions such as birthdays or the popularly celebrated Haldi-Kunku function(a religious event). Sadguru Shree Aniruddha also motivates everyone to plant at least the Neem tree and if possible the Banyan, Sacred Fig, Mango or other trees and small saplings in the available space within one’s home and the residential premises. Before he shared his vision on tree plantation or forestation with his Shraddhavan friends, Sadguru Shree Aniruddha had created a miniature garden comprising of various trees and saplings of fruits and vegetables on his building terrace. Only after first implementing the concept himself, did Sadguru Aniruddha encourage his friends to do so. 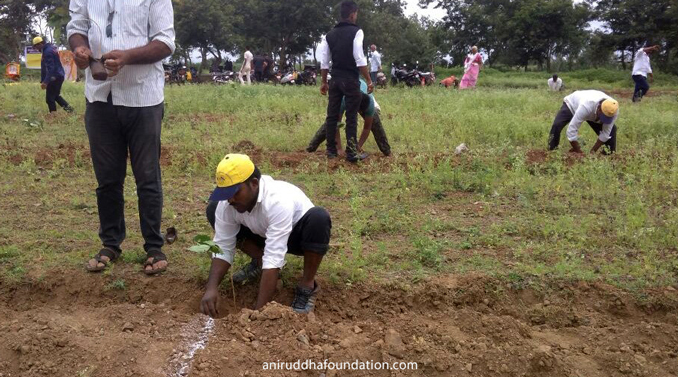 More than 60 thousand saplings were planted through the drive due to Sadguru Shree Aniruddha’s inspiration. The Tree Plantation not only adds to the beauty of nature, but it also helps to cease global warming and maintain the balance disturbed by climate change and also maintain environmental balance. Additionally, dense forests enable a reasonable amount of rainfall and safeguard against the risk posed due to a deluge. Trees also allow the water to percolate deep into the ground and increase the underground water reserves, prevents soil erosion and maintains the quality of the soil. Trees absorb the foul and harmful toxic gases (viz. nitrogen oxide, sulphur dioxide, ammonia, etc.) and release oxygen providing pure, clean and fresh air. A person usually inhales oxygen in amounts equivalent to approximately three cylinders per day. One tree produces about 260 pounds of oxygen every year. Therefore, fully grown trees over one acre of land can certainly supply sufficient oxygen for 18 people throughout the year! It highlights the extraordinary significance of tree plantation for human beings. 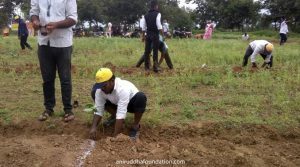 Sadguru Shree Aniruddha Foundation and Aniruddha’s Academy Of Disaster Management, have together thus pledged to keep the tree plantation project active on a large scale.